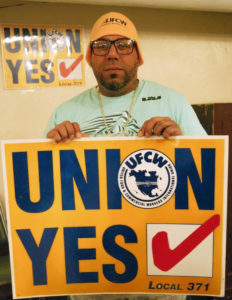 On Feb. 1, 51 workers at Severance Foods, Inc. in Hartford, Connecticut, voted to join UFCW Local 371. The workers at Severance Foods manufacture a large variety of tortilla chips that are distributed worldwide. In spite of union-busting tactics and intimidation, the workers were determined to join UFCW Local 371 because they were concerned about wages, medical insurance, and respect in the workplace. “We voted to unionize to get better benefits, sick days, better safety equipment and raises,” said Severance Foods worker Jan Paul Calo. On Jan. 31, members of UFCW Local 371, along with elected officials and community allies, stood in solidarity with the Severance Foods workers as they prepared to cast their votes in a secret ballot election to join our union. Organizers used Hustle, the innovative texting app, to reach out to workers at Severance Foods, as well as to coordinate the rally before the vote.